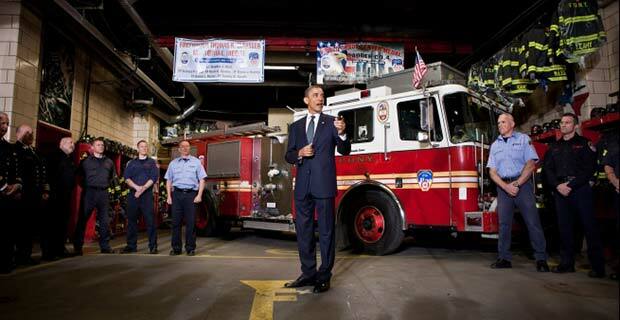 President Barack Obama met with members of Fire Engine 54, Battalion Nine on Thursday when he was in town to lay a wreath at Ground Zero. The wreath was laid at the foot of the Survivor Tree, which was badly damaged during the terror attacks but was found beneath a pile of rubble and subsequently replanted and serves as a symbol of the nation’s resiliency. The President did not make a speech and spoke in measured words. What do you think of the Presidents words?